Starting a compost pile is hard physical work for the lower back. Starting a compost pile is hard physical work and not for the faint hearted; your own humus is without equal. Nature retains the fertility of the earth by returning all dead plant and animal material to the soil. It is decomposed to humus, compost, by bacteria, microbes, earthworms, millipedes, snails and insects and a million tiny creepy crawlies. 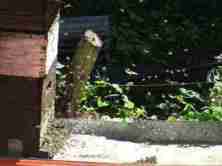 It's an entirely natural process but it can be hastened by making a compost pile. 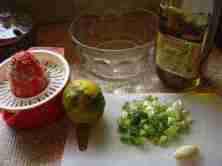 You can also add bokashi, bacteria that further enhance the fermentation. I am currently experimenting with that and will report in due course. This page was last updated by Bernard Preston on 23rd November, 2018. If you are serious about the earth and love gardening, there are few more rewarding pastimes than making your own compost heap. It lies at the heart of organic gardening. Not unimportant is that it tidies up the grass cuttings, fallen leaves, small twigs and branches, organic kitchen waste that you would otherwise have to transport to the dump. It's one small helper in the race to end waste. Conventional agricultural methods will return nitrogen and phosphate to the soil, but the host of micronutrients soon become deficient; and so of course the food grown thereon is also short of selenium and zinc and a thousand other substances needed to sustain optimal health of both the plant and the human who eats it. You either have to take a multitude of supplements, or get busy with starting a compost pile. In the graphic above you can see where I've been tidying up old broccoli, Brussel sprouts and rocket plants. 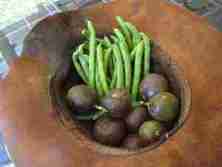 They are bolting with the advent of summer; they make perfect composting material. Surprisingly, a healthy compost heap, one where aerobic respiration is happening has no foul odour at all. 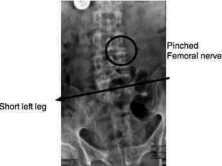 It's the anaerobes that stink. Your pile needs plenty of air. Compost encourages microbiological activity in the soil, improves the water retention and the soil structure. 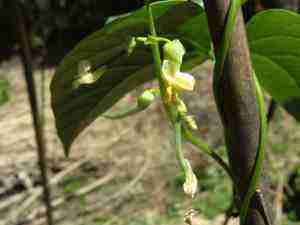 It contains most of a plant's nutritional requirements, feeding the soil and produces healthy crops. Most of the work of composting is done by a host of micro organisms that thrive in warm, moist and, very important, an aerated environment. Compacted heaps may stink. 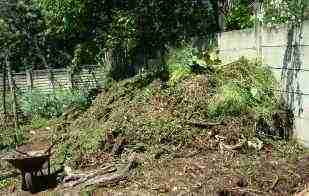 Your compost heaps needs to be moist for your vast army of micro organisms to flourish, but a waterlogged pile will tend to be anaerobic. They need air. 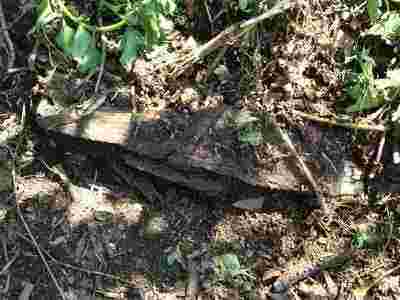 You will probably periodically have heavy rains so, to improve the drainage, at the base, I like to place some old rotting logs beneath the first layers of coarse material. I like to toss in a bag or two of cow or horse manure that I collect whilst gliding; during the week the cattle are allowed to roam on the aerodrome; this is Africa. The rough material once the hens have finished with it is also rich in their droppings and is perfect when starting a compost pile. To build a compost heap you have to use a bit of science, and some folklore. When starting a compost pile like that above, I always begin with thick stems such as from old maize plants, ginger and hydrangea prunings that you are clearing at the end of summer and in the winter. Coarse straw from stables would be perfect too, or old rotting logs. Really, all this is just about getting your garden soil ready for your seeds and young plants. Starting a compost pile with all the health benefit and self satisfaction of growing and enjoying organic foods cannot be overstated. Just see the huge but sweet butternut that we turn for months into delicious soup. Really it's part of working with nature, rather than against it. What scientists are now calling backyard permaculture. If you want normal cholesterol without statins and much less chance of cancer and heart disease, then start thinking of your own garden with none of the toxic chemicals that now proliferate on the planet's farms where your food is grown. It's also, after recycling, the next step of operation end waste. It all starts in the kitchen where you need the right bin; read more about it at compost bins gardening. Then on top of this base you can pile all your grass cuttings, kitchen waste, and the mountains of leaves and prunings that every garden produces. Don't send them to the dump; making a compost pile is the solution. Old logs like these make the perfect foundation for your compost pile. A couple layers of chicken, horse, or cow manure adds nitrogen and speeds up the process of composting. 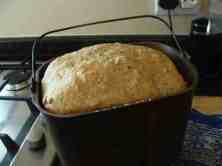 When healthy aerobic fermentation is happening, the pile can actually get quite hot. In cold weather you might want to cover your compost pile with a layer of soil, old sacks, or cardboard to keep it warm. When we returned from our seven year sojourn in the Netherlands, our garden was smothered by a leafy ground cover, commonly known as Wandering Jew. Despite the fears of friends and family, I've found that it makes perfect compost material, breaking down to a thick, dark humus. Weeds from the garden can be used too, but it's often best to let them dry out and die first, and not if they've seeded. The heat may kill some of the them, but not all. It's often said that you can't use orange peels for the heap, but I've tried using the left overs of making our own juice; and it takes no longer to decompose them than the rest of the pile. And the compost has a beautiful gentle scent of citrus; it's lovely. 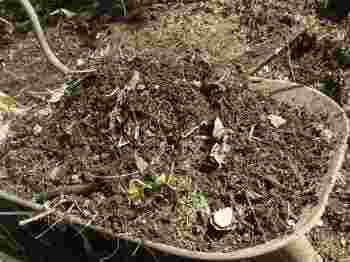 Healthy compost is dark brown, almost black, and has a sweet clean smell of the earth. I'm unsure but I do think that compost can provide a good environment for cutworms that may attack your young plants to flourish, so I've taken to digging a trench, and covering the compost with 6", 15cm, of earth. That seems to sort them out. Alternatively, spread the compost, and turn it a few times before planting. 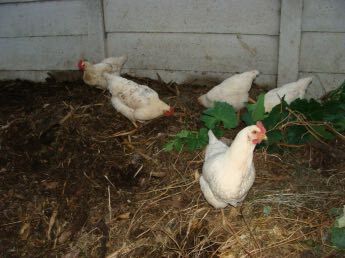 Recently we've been then allowing the hens to check it out; they wander through the compost. They love cutworms. Best of all, I've recently built a movable chicken tractor; there are many designs. Placing it over new compost, before planting, ensures there are no unfriendly cutworms left in the soil. The long and the short of it is that starting a compost pile is not without a few hiccups. This is an update; the hens have really provided the solution to three invaders in our garden; snails, cutworms and the Mexican bean beetle that completely nailed our green beans for three years in a row. It's all part of the synergy of green living. 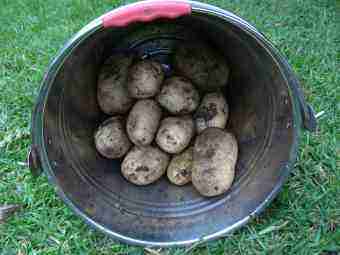 Just look at these organic spuds; 12 large potatoes from just one plant. Best of all is lifting them with your grandchild. It turns a chore into a treasure hunt! Incidentally, new potatoes have much less of a glycemic effect than those from cold storage; read, they are less fattening and do not cause a surge in blood glucose. Earthworms love a compost heap, and their droppings do wonders for your humus. It's a good idea when working in the garden, should you find earthworms, collect them and drop them on the pile. They will multiply ten-fold, and you'll return far more to mother Earth than you took out. Earthworms and starting a compost pile remain central to our thoughts on the ten commandments of food security and sustainability. The wonder of worm farms I've only recently discovered; if you have a problem with the world's greatest invader specie, the brown rat, then don't put your kitchen waste into the compost pile, but into your fetida worm farm; with a lid. They complement your own earthworms. When starting a compost pile you need all the living creatures you can find, but not rats, to break down the kitchen and garden waste. What is fetida, and what is a worm farm you may be asking; they are the worms that are credited, rightly or wrongly, with cleaning up the cesspool of human garbage that created the environment for the Black Plague in the Middle Ages. Having been starting a compost pile, and keeping fetida worm farms for years now, I'm glad to report that the wrigglies are to be found throughout our heaps of vegetable matter, but not in the soil; they aren't an invader species, as far as I can tell. In any event they get cleaned up by our free range hens. Growing green beans is really not difficult. 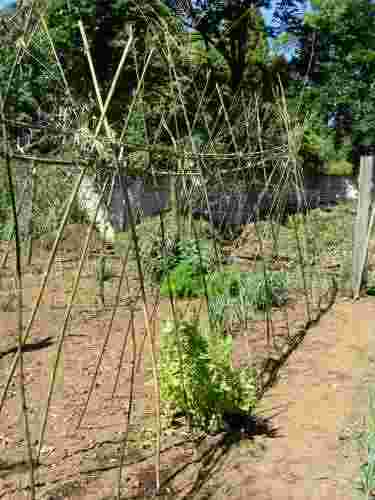 All you need is a stake, pole, fence, or rose trellis, but I made the latticework below because we like to eat green beans every day in the summer to reduce our reliance on red meat and dairy for protein. Your growing green beans, bush or pole, are heavy feeders and starting a compost pile means a much larger and tastier crop. Plus, because of nitrogen fixation bacteria on the roots of all legumes, the next crop will take off. 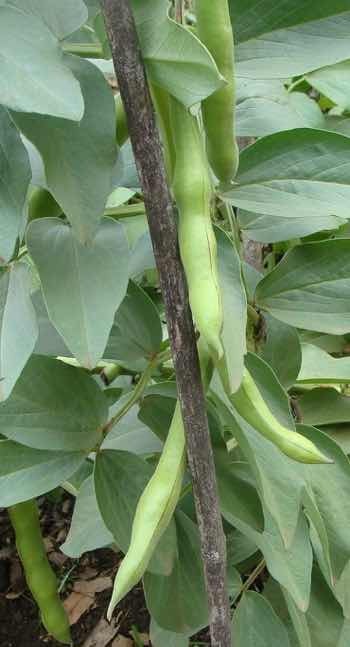 There are few more rewarding vegetables in the garden than pole beans. The bush variety have a shorter growing season, but picking them will break your back and, if you allow the chooks out of the chicken tractor design they will go straight for the green beans in the garden; they too need the protein. Plus beans are full of phytosterols, the stuff that protects against cancer and cholesterol; those chickens know what's good for them! Plus, picked fresh from the garden and blanched light are simply delicious. It's a win win situation. Into each hole at the base of these bamboo stakes you'll place a good shovel-full from making your own compost. 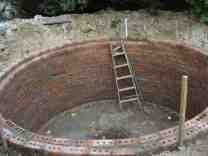 Really it's not difficult, it takes 3 to 4 months to make compost. 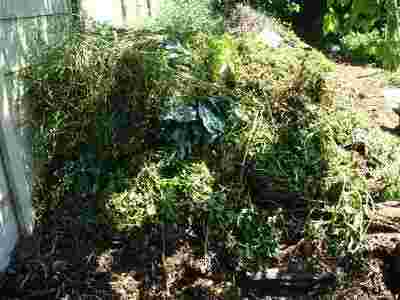 Starting a compost pile is so very rewarding if you are serious about gardening. Another legume certainly worth considering is the broad bean; I won't pretend it's my favourite, but it's amazing what the tongue can be taught at least to tolerate; I mean, fifty years ago I wouldn't even consider a green salad; now I love it. By the same token each year, harvested young and with imaginative cooking they have become a staple winter protein in our family. One big plus is that how to plant broad beans is really very easy; and the coarse leaves, stems and roots are perfect at the end of the season when starting a compost pile; they are full of nitrogen forming bacteria. The teepee above isn't suitable for staking; you need horizontal bars; I'll do a page on that elsewhere; otherwise they flop over with the weight of the fruit. “There is no waste in the way we farm; we don’t use any fertilisers." Phytochemical foods are vastly beneficial, yet science still doesn't understand a tenth of what they do; starting a compost pile will enrich your backyard vegetables and fruit. Phytochemicals make up the thousands of substances in natural foods that have a beneficial but often unproven effect on health. Many of them give vegetables their bright colours. Others, like lignans in seeds, have proven anti cholesterol properties, and help prevent breast cancer. They make your eyes water when peeling onions, and your mouth water when you see a bowl of fresh strawberries; they are the fragrance in sweet basil that's to die for. They are also the fatty acids in many oils. And people who eat them have less cancer and heart disease, lower blood pressure, less breast and prostate disease; the sky's the limit. They are better absorbed if eaten with a little fat; dribble olive oil over your salads, or an avocado, or a good dollop of hummus. If you're a gardener, even on a small scale, starting a compost pile is where it all starts if you want to grow nutritious, great-tasting veggies. Hens just love it when you are starting a compost heap; it's Christmas with a feast of worms and other tiny creatures for dinner laying in wait in the future. Previously we banned the hens from the compost heap; the creapie crawlies were too precious, but since the advent of the worm farm we have a surplus, and the ladies are welcome to join me when I turn the pile; I open the chicken tractor door and they dive into the garden; best chicken feed includes access to the compost pile. It's also the best solution to the question can you feed eggshells to hens? Toss them into the compost pile for the birds, having processed them slightly. Just look at their excitement, and that beautiful rich black compost on the left of this picture; their manure contributes to it. Tomorrow, by the barrowload, one by two by three, I'll be moving it to where we will be planting the winter vegetable garden; broccoli and broad beans, spring onions and lettuce, cabbages and kings. There'll be a feast in a couple months for us too. We are always looking for a surplus; gifts for friends, and chiropractic patients; educating them on the virtues of healthy living is part of the deal; this year I'm going to try the surplus broad beans on the hens too instead of laying mash. It's all part of a process known as permaculture; creating a stable environment and hoping to leave a habitable planet behind for our grandchildren; no till helps keep carbon in the soil and removing it from the atmosphere. It will be rich in plant protein, cancer preventing kaempferol and a host of other vitamins and phytochemicals. This is the stuff that keeps Dr Death at bay; for a season. I'm looking forward to an extra twenty good years of sparkling good health, sitting under those trees we once planted, sipping tea and watch the grandkids grow up. Is it to be believed that the good wife and I have reached seventy, and take no medication? Let your food be your medicine. The hens, worms and compost piles all help in the race to end waste; over one third of the food produced for humans is never actually eaten by them. These creatures will enjoy all your left overs, in the process fertilizing your garden. 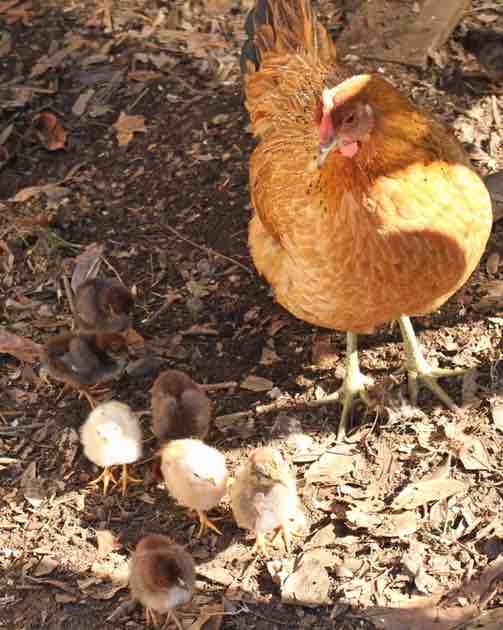 Chickens in the garden have created a whole new dimension to our backyard permaculture. Making a compost pile is for those more interested in what's actually going on; about aerobic vs anaerobic composting. There something profound going on inside that pile. 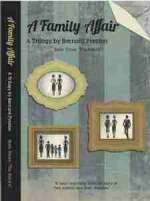 Bernard Preston is also a writer, busy with his seventh book to be published hopefully late in 2019. Have you read any of the others? If you are enjoying this site, you'll love Doc Bernie's chiropractic books; find them in the navigation bar on your left. When he's not writing, he's starting a compost pile, or working the hens and worm farms, or tinkering with his solar generator.